A few weeks ago, right around the beginning of June, I noticed this social media trend of people welcoming summer. To many, it would seem, the first of June marks the start of the season. My first reaction was, “Hey, what about the summer solstice? Isn’t that the official beginning of summer?” But, upon further reflection, I realized I have my summer signs too, and they’re rarely coordinated with the solstice. When I was younger, there was no confusion about the start and end of summer. It was clearly demarcated by the end of one school year and the beginning of the next. Ten or so glorious weeks where one day flowed to the next with no distinction between weeks and weekends. No homework, no bus rides, no hall passes to the bathroom. It’s bedtime, dammit. I know it is! Then why is it so bright in here? At the height of summer, it’s often light, or at least dusky, until ten o’clock at night. Even as a teenager, my internal clock was never calibrated for the rhythms of a night owl. Somewhere around nine, I’m drawn like a magnet to begin my “shutdown procedures” for the day. Fifteen or twenty minutes later, I’m in bed reading, acutely aware that there’s a whole word of activity still going on. Indeed, I can hear neighbors outside visiting around a fire pit, or dogs barking in protest that fetch will soon end. In the early 90s, I lived in Alaska. It was a life of extremes – the shortest of short winter days and the longest of long summer ones. At the beginning of each summer, the near endless daylight was invigorating. I wanted to soak it all in, not miss a minute, mistakenly thinking I could somehow make up for the vitamin D deficient winter months. However, by the second or third week of little sleep, I was forced to don a classic Reuben Kincaid sleeping mask to force my biorhythms back on course. Not Shirley Temple Black, mind you – sophisticated, intelligent woman who served as US ambassador to Ghana and Czechoslovakia. No, no, not that one. The other one. The little girl with impossibly curly hair and dewy skin who romped around with bobby socks and lollipops as big as her head, singing to sooth the masses. Okay, it might just be the impossibly curly hair that Shirley and I have in common during summer. I haven’t worn bobby socks in decades – probably around the last time my skin was described as dewy. Perhaps the better comparison is Gilda Radner’s beloved character Roseanne Roseannadanna. The difference is a couple percentage points of humidity and the availability of weather-appropriate hair products. My summer-time hair is like an inconsolable child who left her favorite sleepy-time doll at a friend’s house – a friend you aren’t going to see again for about three months. My hair cannot be tamed. Ringlets are like whack-a-moles. Tamp one down on the left, only to have another spring to life on the right. Let’s just say it’s a season of bad hair days. Once the shorts, tank tops, and sandals are front and center in the closet, summer has arrived. Unfortunately, this also means seeing a lot more midriffs than is really necessary. I don’t consider myself to be a particularly modest person, but something about summer time wardrobes brings it out in me. I’m often surprised at the shortness of shorts or dresses, particularly when found in the most unlikely of places – churches, doctors’ offices, schools. – and, of course, Walmart. Everyone’s got there ‘You’ll never guess what I saw at Walmart’ story. No place seems to be o ff limits. 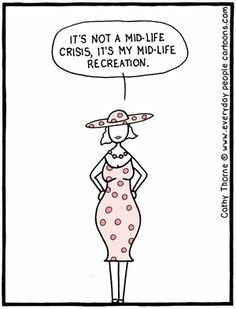 Perhaps it’s just sour grapes on my part since most of those slinky items are no longer age appropriate – or rather body shape appropriate – for me, but I’d sure be pleased if beachwear was kept on the beach and there was still a sense of decorum when we’re out in public. Of course, there are fun things about summer too. That first time you lay out in the sun each year is utter relaxation. The summer fruits like nectarines and plums seem particularly delicious after not having them for months. Barbecues, outdoor concerts, hiking my favorite trails. It’s a pretty good time, even if I am running around with bad hair and feeling sleep-deprived. What are your summer signs? Maybe it’s an annual trip to the same place each year, a summer tennis league, or picking strawberries. Would love to hear your thoughts! Wear your sunscreen (and some clothes) and have a great summer. A friend and I often discuss the ubiquitous nature of acronyms in this brave new world of hashtags and texting. We both love words and language, but it’s fair to say that texting has ushered in a whole new language, one for which there’s no special course or Rosetta Stone. So how is one to go about cracking the secret code? Silly question, right? You’re probably going to tell me there’s an app for that. And you’d be right. Of course there is. But if you don’t come from the generation that intuitively knows what LOL, SMH, and ROTFL mean, then you also don’t naturally look for solutions to every problem in the app store. My friend’s solution is to work in an office where 20-somethings abound. She has living, texting millennials in her midst, and she makes good use of them. She mines them for information and then discretely shares the data with her cohort, of which I am one. As with most knowledge, though, if it isn’t used soon after acquisition, it can end up in the recycle bin of the mind. I bristle at using too many of them. I don’t even really like to LOL. In my day, we only had a few acronyms to keep up with – PS and RSVP come to mind. They must seem archaic these days, particularly since both of them were primarily related to written letters or invitations, vestiges of a bygone era. In other acronym-related news, ‘WTF’ was recently listed among the new entries to the Merriam-Webster dictionary, to which I want to respond – “WTF? ?” I mean, really, does this warrant a dictionary entry, other than perhaps in the Urban Dictionary? Merriam and Webster sure think so. I appreciate that language evolves and changes. As well it should, or we would still be talking in ‘thous’ and ‘thees’. Perhaps the pace is too fast for me these days. Perhaps I’m bitter it wasn’t my generation that introduced the wild change. 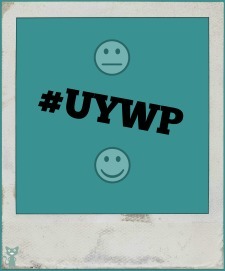 Or perhaps I just want you to UYWP. By the end of this post, it will be abundantly clear t hat you have not unwittingly landed on the next Ansel Adams, Annie Leibovitz, or even <insert favorite Instagrammer here> . However, I do get a chance to see some cool things, so thought I would share. Plus, I’ve got some mad iPad skills. 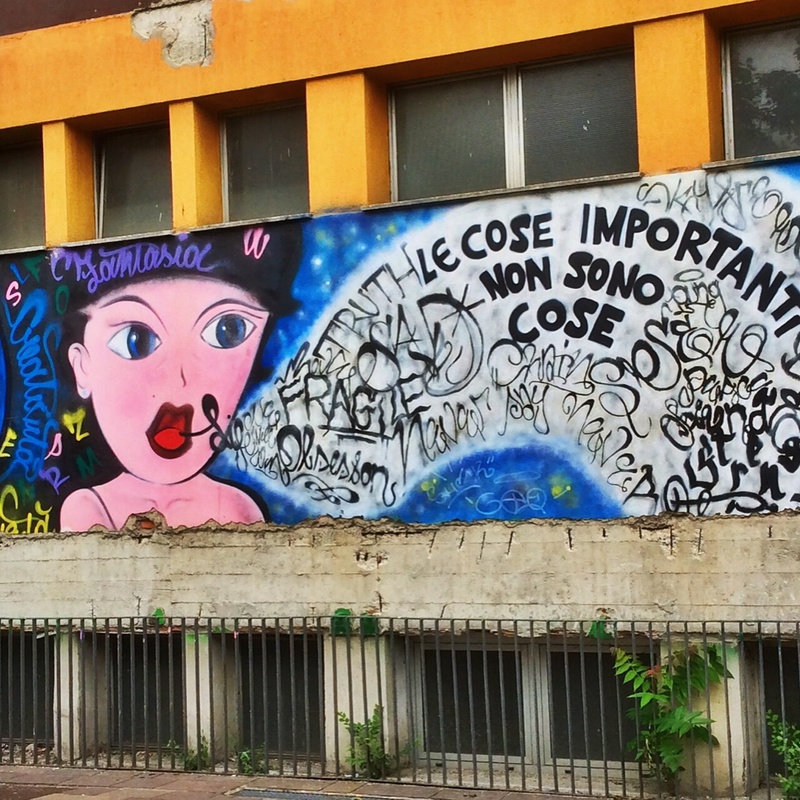 This striking mural of a woman clutching a heart can be found in Via Morosini in Milan. It’s part of an urban regeneration project that’s goal is to take back an abandoned area of the neighborhood and establish it as a “cultural garden”. There’s certainly not much traditional gardening going on, but the space is clean, safe, and interesting. There are actually two murals spanning the entire side of adjacent apartment buildings. This picture gives you some perspective of how the murals really command the space. The area has quickly become a meeting place, as evidenced by the three men relaxing and chatting on the bench. some books in English, but since I came without anything to leave, I amused myself by browsing the collection. A few women sat at nearby tables visiting, but keeping an eye on the books the whole time, lest the threatening clouds open up and drench them – something that seems to happen often at this time of year. Milan is filled with graffiti, both the kind that can easily be elevated to the category of street art as well as the kind that’s simple vandalism. I would argue that this picture qualifies as street art. There’s definite artistry at play, and I love the message – “The important things aren’t things.” It’s not every day that you get a life lesson from the side of a building.